Royal Canin Fibre Response Dry Food for Dogs is a complete and balanced veterinary diet for dogs with fibre responsive colitis, constipation, stress related diarrhoea and conditions requiring a high fibre level. 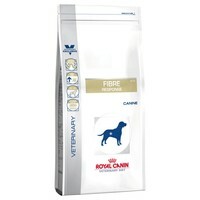 Formulated specially to encourage a healthy gut and digestive tract, and improve the condition of internal systems, Royal Canin Fibre Response Vet Diet has been made with a complex blend of antioxidants, digestible fish oils, pulps, rice and proteins to promote the health of cells, DNA and the immune system. Our miniature dachshund has had colitis since he was 8 years old and been on daily steroids and antibiotics ever since. He is now 19 and because of the medications' side effects we weaned him off them and changed his diet to Fibre Response. His stools are the best they have ever been since starting this food and he loves the taste. I would recommend Fibre Response to anybody that has a dog with intestinal problems. This food has helped enormously in maintaining a healthy gut which means our little dog no longer suffers from the awful symptoms of colitis.